NexusDB is extremely flexible in its deployment options. There are many databases that support embedded deployment or Client/Server deployment; NexusDB supports both deployment options. NexusDB also supports a hybrid mixed deployment option whereby an embedded database engine can be exposed to remote clients. 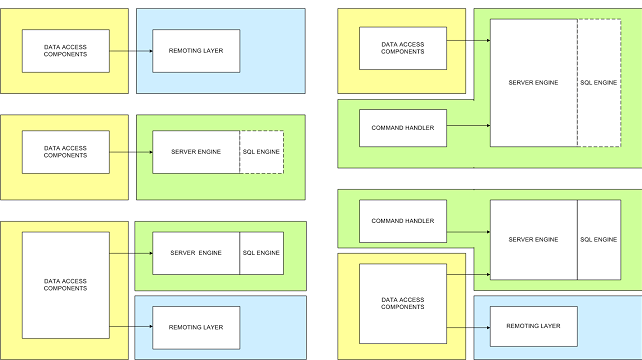 In an embedded mode, both Client and Server layers are contained within a single process. The remoting layer is not present in an embedded deployment. NexusDB in embedded mode works equally well in web applications such as ISAPI extensions or Apache DSO's. As a Client/Server deployment NexusDB runs as a separate Server process that networked clients can connect to through the remoting layer. This separate Server process can either be a regular executable or a windows service. The included nxServer.exe can be registered as a windows service. A Hybrid deployment is a combination of an embedded and client/server deployment. Just as an embedded deployment the Client and Server layers are contained within one process. In a hybrid deployment, this same process exposes a remoting layer transport and includes the server command handler. This remoting layer and command handler enables separate clients to utilize the server engine in exactly the same way as a Client/Server deployment.